How much does My Meal Plan Premium cost? Do you want to enjoy cooler features after signing up for a My Meal Plan account? The Premium Plan is an optional subscription service for the My Meal Plan which allows you to enjoy premium features for a better Meal Plan experience. Auto Planning unlimited with Artificial Intelligence: Yumi is a Meal Planner with an Artificial Intelligence that learns how you eat then automatically create a Meal Plan for you. Grocery List: This is a feature that allows ingredients to be automatically generated for you when you create your Meal Plan. The list of ingredients it creates for you is based on the Recipes and ingredients of the Meal Planner. The ingredients are placed within a specific date in your calendar which is listed as Today, Tomorrow, and This Week. The feature has been created to help you save more time and money. Track your Meals: The Tracking feature allows you to track your meals and help you discover how you can improve the way you eat by analyzing your habits. To start tracking your meals, you need to first add some meals to the Meal Plan. You can simply add meals to the Meal Plan by using the mouse to drag and drop the meal to the preferred date. 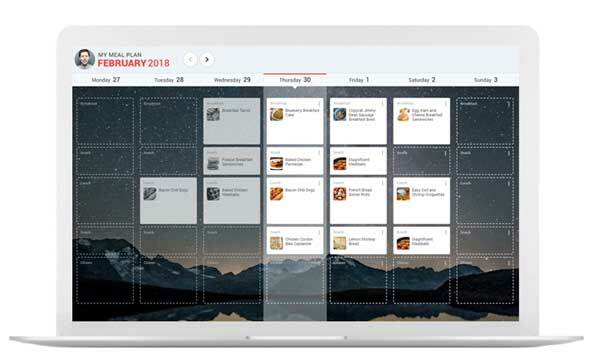 Planning in advance: One of the cool features of the Meal Planner is the ability it gives you to plan your meals ahead. You can easily plan meals based on the date you want. Meals can be planned for weeks, months, and even a year. Collection of Meal Plans: The feature allows the Meal Plans to be under cool collections which have been prepared by our expert nutritionists. With each Recipe placed in the right collection plan to meet different goals. You can choose between different types of Meal Plan collections with different durations, meals per-day, and benefits. Subscribing to the Premium Plan is a yearly subscription which is automatically renewed at the end of each year. If you wish to cancel the auto-renewal of your subscription, you may do that any time before the end of the subscription period.